Enjoy your favourite You.Tube videos on Nokia ®! 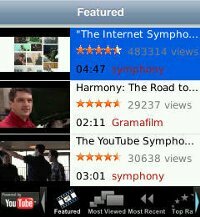 With XENOZU FREE You.Tube player for Nokia® Symbian S60 you can stay in touch with your favourites videos while on the go ! Videos are categorized by Featured, Most Viewed, Most Recent, Top Rated, plus you can search for the videos of your choice. You can also bookmark a video, view the history of the videos you ve watched and get additional video details.